Coming into my freshman year at Penn, I knew that I was entering a place where everyone comes from different backgrounds from all across the world. It was endearing to hear about the diversity of my class during every icebreaker game played during NSO. Being the girl from Florida (1,000 miles away) was no longer considered far away; I was in awe. Personally, traveling has always been something I enjoy and whenever I have traveled during my time at Penn, my experience has been completely different. I go to any city and I know people there who I can crash with or who can show me around, so I don’t get stuck taking embarrassingly touristy photos. 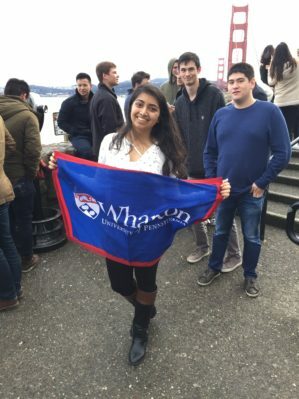 During winter break of my junior year, I participated in the Wharton Industry Exploration Program (WIEP) trip to San Francisco. Arriving a bit early, I was able to meet students from the Bay Area and alumni working there. It made me realize that even when I graduate Penn, I won’t leave it behind. Granted, San Francisco is still in the US, but the idea pervades across the world. This summer, I interned with Aravind Eye Hospitals in India in the city of Pondicherry. I was sure the only other people I would know would be the other two interns from Penn. My first day, there was a researcher from London who turned out to have been a PhD student from Wharton. After we bonded over having some of the same professors and our favorite on-campus restaurants (City Tap House was mentioned), I realized that Penn really was everywhere, and I loved it. The diversity we talk about not only refers to where we come from when we enter Penn but also where we end up when we leave. Hi! My name is Aaisha Gulani and I am originally from Jacksonville, Florida. I am in the class of 2018 and am concentrating in Healthcare Management and Finance along with a minor in the South Asian Studies Department. I have always been interested in healthcare and its intersection with other industries. I am involved in Wharton Women, Wharton Roundtables, South Asia Society, West Philadelphia Volunteering, and Research at HUP. In my free time I love going around Philly and exploring new restaurants and cafes!